A semi-automatic parking installation placing cars on stacked pallets. A suitable solution for access from a single level. A modular system with a customizing potential. Available for dependent and independent parking. Suitable for subscriber and resident parking. The parking capacity is doubled to tripled. Each car may be parked independently. Available combinations: 2 or 3 cars stacked, 1 or 2 cars on a pallet. Available for different clearing heights of pallets, with customizable pallet widths and lengths. Required: an adjusted foundation and the structure height allowing for vertical movements of pallets. 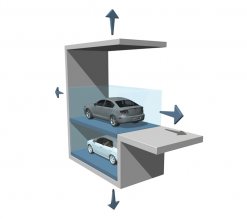 Suitable for two cars stacked on each other, with the top car free to leave only if the bottom slot is empty. Required: the structure height must match the total height of cars parked. A semi-automatic cost-effective parking system for cars stacked on pallets. Available for independent and dependent parking. Suitable for resident parking. Easy to maintain and operate. 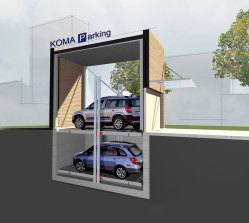 Detached houses, residential blocks and multi-purpose buildings, office buildings, hotels, renovated and reconstructed sites: enhanced parking facility for existent buildings, in particular in cellars, yards and gardens.